Top of the first, one out, runners on first and second. The batter rips a line drive into left field, and the runner from second takes the turn at third and barrels toward home. The left fielder throws a rope to the plate, but it's a little high. Just as the catcher jumps to catch the ball, the runner — who also happens to be a tight end on the Northwestern football team — steps on the plate and plows into the catcher's chest, sending both players flying and knocking the ball loose. Wrong. This is intramural softball, where the passion often reaches major league levels but the rules are designed, among other things, to prevent bone-jarring collisions at the plate, especially when the catcher's only protection is his glove. The runner is out because he didn't slide to avoid the collision — even though it was caused by momentum, not malevolence — while the catcher gets to tell his friends that he absorbed a hit from a Division I football player and still didn't miss a pitch. 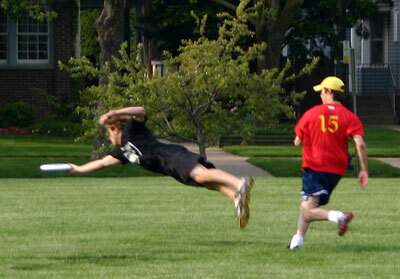 Intramural sports provide the ultimate gathering place for people from all corners of the Northwestern community. More than 3,000 people affiliated with the University — from students and teaching assistants to varsity athletes and athletic neophytes — compete with and against each other every year in games that range from hilariously relaxed to nail-bitingly intense. And while the intramural program is primarily intended to allow people to have some fun, don't try telling that to the teams vying for the coveted Team of the Year award, which this spring the Delta Tau Delta Fraternity won for the second year in a row. The honor, which goes to the team that accumulates the most points based on its performance in all intramural sports and competitions, carries some serious prestige and campus bragging rights, not to mention a $750 gift card to Chicago's ESPN Zone. Still, the intramural program offers plenty of opportunities for people who aren't necessarily looking for cutthroat competition. Most of the program's eight sports — dodgeball, volleyball and flag football in the fall; basketball and floor hockey in the winter; and soccer, softball and ultimate Frisbee in the spring — are divided into three leagues. (Dodgeball and ultimate Frisbee have only two divisions.) The Purple League is reserved for the most competitive teams, while the White League is open to teams a notch below. The Co-rec League requires that teams have an even mix of men and women. Intramurals also include competitions such as the Spring Break Splash dive contest, a 3-point basketball shootout, a home run derby and a golf outing, all of which count toward the Team of the Year standings. 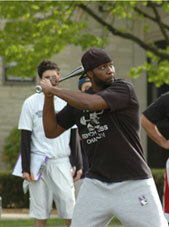 People play intramurals for a variety of reasons, says Ryan Coleman, Northwestern's manager of recreational sports. "You get your frats, which are competitive and really want to win, and you get people who are just looking to have a good time with their friends," Coleman says. "It's a good way for people to stay in shape and have fun. But once you get to each league's championship game, the division between leagues doesn't matter." 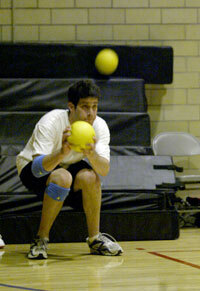 Adam Schaefer (J07) knows something about the competitive nature of intramural sports. The former four-sport high school athlete from Roswell, Ga., jumped into intramurals only a few weeks after arriving at Northwestern by starting a team that played in each sport's Purple League for all four years. "I just love the competition," says Schaefer, who organized practices and drew up playbooks for his football and basketball teams. "Plus, practically everybody I know at Northwestern I met through IM sports. It's a great way to make new friends and strengthen old relationships, keeping that camaraderie you had in team sports during high school." Competitive or not, intramural games often take interesting twists and turns. Catherine Shen, a Weinberg College of Arts and Sciences senior from Gaithersburg, Md., says the craziest play in her intramural career took place this spring during a soccer game with the score tied and under two minutes to play. Weinberg senior Jinglu "Lu" Sun, a defender on Shen's team, gained control of the ball at midfield and fired the ball toward the goal. "He kicked the ball all the way down the length of the field from the center line," she says, "but he kicked so hard that his shoe flew along with the ball. The shoe went about halfway down the field, and the ball went into the goal. I think everyone was watching the shoe, including the other team's goalie, so the ball ended up going right between the goalie's legs. We call that kick 'The Lu,' but he hasn't been able to replicate it since then. We'll see next year." Whether players are fresh out of high school or qualify as intramural veterans, the program allows participants to continue lifelong passions. Rabbi Dov Hillel Klein, a devoted Chicago White Sox fan and director of Northwestern's Tannenbaum Chabad House, plays in pickup softball games with friends two nights a week in addition to playing on the Alpha Epsilon Pi Fraternity's intramural softball team. "Softball's my thing. I just love to play," says Klein, who plays right-center field (there are four outfielders in slo-pitch softball) and second base. "The level of competition is good as long as it doesn't get personal, and I've never seen it get personal. Competition is good — I want to win. And that's really what intramural sports are about — they're about competitive drive, but they're also about sportsmanship and realizing we're all part of the Northwestern community."